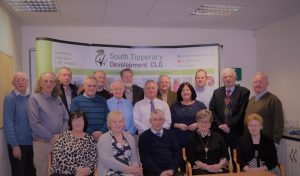 STDC Board Of Directors January 2019 : Front Row Left to Right : Carmel Troy, Helen Quirke, Simon Ryan Chairman, Teresa Collins Hinchey, Sr Mary Walsh. Middle Row : Willie O Donnell, Peadar O Donnell, John Crosse, Richard Long, PJ English, Fiona Kennedy, Liam Ahearn and Bernard Lennon. Back Row : Andy Hennessy, Kevin Collins, Michael Ryan, Pat O Brien, Cllr Andy Moloney.